"The cozy days of summer aren't always cozy!" I'm Kalli Ballas--a shy, slightly OCD fashion designer with a prissy calico cat and hand sanitizer always at the ready. I hate germs and this blistering summer heat is breeding plenty. It doesn't help that my neighbor, loud and boisterous Detective Nik Stevens, has a big, sloppy St. Bernard and a devil-may-care attitude. Living next door to him is a nightmare! The problem is I was adopted into a big Greek family, so I'm Greek by association, and Nik is half-Greek, which is apparently "Greek enough" for the mamas. Ever since spring fever set in for the both of them, they won't stop trying to fix us up, even though it is crystal clear that we are NOT a good match. Throw in a freak accident giving me the gift of reading minds through the power a touch--a nightmare for someone like me--and my best friend being accused of murder, and the cozy turns into chaos pretty quickly. Is it so wrong that I just want my life to return to normal? Something tells me I will never see normal again. So tell me, what do you all do during the cozy days of summer? Anything has to be better than solving a murder. Don't forget to enter our Cozy Days of Summer giveaway. Kari is giving away a copy of any of her mysteries--winner's choice (check out her website and pick one @ karileetownsend.com ) Leave a comment on this post before midnight tonight for a chance to win. At the stroke of 12:00 the next drawing begins! Check back the next day to see if you won. I have not tried this series before, but it sounds great, The heroine has a cat what could be a better recommendation? This sounds wonderful. I love the thought of reading minds. Nothing better in the cozy days of summer than sitting in the shade on the porch, fan turning slowly overhead, cool drink - and a book! What could be better than sleuthing! Got to have a book, and a garden to read it in! I have not as yet read any books written by this author but I would love to—thanks for the opportunity to win a book! My favorite cozy thing to do in summer is to sit in my backyard and read or knit under my big shade tree! I haven't heard of this series before. But it sounds wonderful. That's what I do for cozy summers - read a lot and discover new authors. Haha you guys are awesome! I have fun in this series just like I do in my Fortune Teller Mysteries. Enjoy and good luck! My family hates the heat, but I would rather be hot than cold. I just sit still and read a book and I'm fine. When I am cold, I can never seem to get warm. I enjoy the Fortune Teller Mysteries. The setting reminds me of a community not to far away from me. Hi Kari. This book just arrived, can't wait to start it. By the way, I loved Kicking the Habit and I am excited that Sunny has a new adventure to look forward to. You rock Mary Louise! And if you win, you can get a copy of Poison in the Palm in October when it comes out (since you've read everything else of mine ;) Or choose one of my romances or women's fiction under Kari Lee Harmon. You had me at cat. I'll be starting this series next week as a reward for turning in my edits. Thanks. Love sitting outside reading a good book. I love to read and play golf during the summer---just send some warmth my way, so far it's been a cool summer here. "normal" is a setting on the washer/dryer--not life! Another day of rain - so will spend some quality time reading inside! Read Trouble in the Tarot a few weeks ago - SUPER - and looking forward to book 4. Hi Kari! Just went to your website and checked out your writings. You certainly have an imagination! 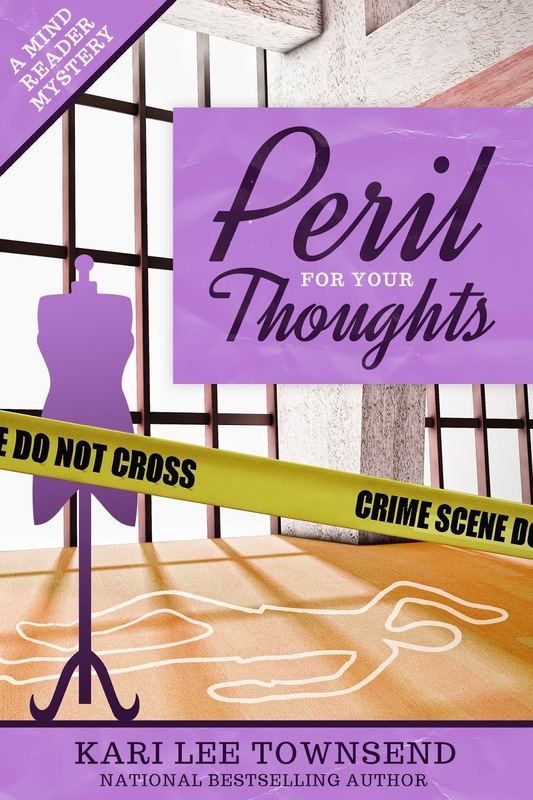 I'd love to win Peril For Your Thoughts. This summer, my DH and I are doing something really special. We're going to Alaska for two weeks to visit our children and grandchildren. We have a grandson we've yet to see who is 19 months old already. Going to do a bit of halibut fishing too. Thanks for a chance to win. Have fun in Alaska! We went there on our 15th wedding anniversary and loved it. Nice! Glad you enjoyed them. I keep cool in the air conditioning, watch TV, read, and sometimes go to a festival and play Bingo. It's only 71 today which is great because the last three days were 89 or hotter. One day it got up to 92 here in Ohio. Glad to hear that there will be another fortune teller mystery coming out. This sounds like a great series. Thank you for this opportunity. During the cozy days of summer I prefer to stay in the air conditioning! I can't take the heat. I did just buy my dog a pool...but so far he doesn't want to go in. Sigh. I enjoy your fortune teller series and need to start this one! Haven't heard of this series but look forward to adding this fun read to my TBR stack. Cozy days of summer mean laying out in the sun with a good book. I prefer staying in with some light A/C (it's currently too cool in the house for me) and a good book. And maybe some tasty popcorn. Not a big fan of the heat! Grateful to be moving to the coast after I get married next month! I love to sit in a sand chair on the beach & read a cozy mystery! My idea of heaven! i love a big family..great setting for lots of characters. I love reading a cozy by the side of the pool, or on the porch in the evening, or even curled up in my reading chair with the fan, some sweet tea and popcorn. This book sounds like a lot of fun. I love cozy mysteries. I was also checking out her Diva series and they sound fantastic too. I haven't read this series yet, but it sounds great! Would love to start reading these books and I love a good mystery. Would love to start reading these books. I love a good mystery. And if a cat or dog is involved all the better.or a Diva, I can relate to a pet loving Diva..